Is your website using Facebook to the fullest? Are you wondering how you can get the most out of Facebook for your business? To learn how to use Facebook to your advantage, this episode of the Social Media Marketing podcast goes deep into the subject. In this episode, you’ll discover 5 Facebook hacks you can employ on your website to help drive more traffic and exposure. You have probably noticed on Facebook that some posts have large images at the top, and underneath there is a URL, the website name and a small description. If you have content on your website that you want seen in the news feed, then you can alter the size of the image, which will lead to more exposure and click-throughs to your website. 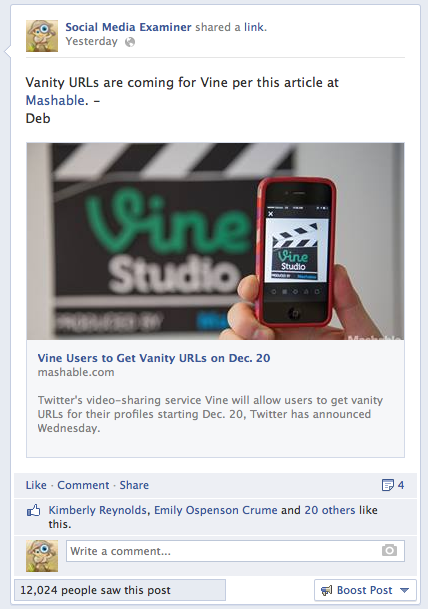 Here’s an example of a shared link with a small image in the Facebook news feed. Here’s an example of how a large image appears in the Facebook news feed. Facebook queries all of the actual images that are on your website and will choose to display the image with the largest dimensions. Facebook only allows users to select three images. To see how this works, check out my friend Jon Loomer’s guide on Facebook Link Thumbnail Image Dimensions. The aspect ratio of your image is the critical factor. The aspect ratio is 1.91:1. This calculates out to about 1200 pixels wide by 627 pixels deep. The ideal size is 400 pixels wide by 209 pixels deep. You need to make sure that at least one of your images inside the article is larger than all of the others. It should be in the 1.91:1 aspect ratio. Listen to the show to find out what happens when an image is deeper than it is wide and how it can appear in the Facebook news feed. Facebook has its own language called Open Graph. This allows you to tell Facebook certain kinds of attributes, which include the image it should use as a default on a page, where it should pull text from and what the description should be. This kind of information helps your content appear more appropriately in the news feed. You can discover all of the data behind Open Graph and find everything you need to know about how it works. It’s a great guide even for the non-techie. To learn more about Open Graph, check out the Get Started tutorial. If you are on WordPress, Open Graph is easy to implement with a plugin called WP Open Graph. It allows you to set data on a macro-level and on a post-by-post basis. 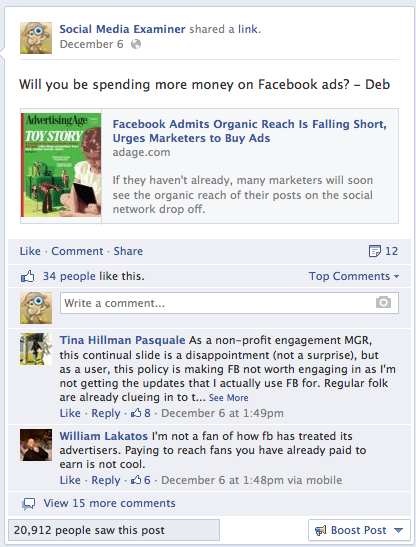 It’s a great way to control what shows up when people share your articles on Facebook. The best way to keep your shared content up to date on Facebook is to use Facebook’s Debugger. It’s a great tool to stop Facebook from pulling in information that’s no longer relevant. Listen to the show to find out how the Debugger tool works, and how it will help you with your Open Graph. When you add a Facebook Share button to your website, you need to make sure that you use the code from Facebook or the WordPress plugin, which was developed by Facebook. It doesn’t matter if your website is WordPress or not, you can visit here and paste in the URL you want to share and choose the different layouts for your button. There are many different Share buttons to choose from. You’ll discover the best Share button to use for social proof on your website. If you use WordPress, it’s easy to use their default plugin. This plugin allows you to do the same as the Facebook one, but it does everything automatically for you. When it comes to the placement of the Share button on your website, many people like to put it at the top of a blog post. This way, users can see how many people have shared the article, which incites them to read it too. Others like to put the button at the bottom of the post. You can also use a plugin like Digg Digg, which allows the Share buttons to float down the side of the article as people scroll through. Listen to the show to learn why I’m a big fan of having a Share button at the top and the bottom of an article. Although a lot of you may already have Google Analytics installed on your website, you may not know that you can use Google Analytics to analyze your traffic that comes from Facebook. When you log into Google Analytics, you need to click on Acquisition. Underneath Acquisition is a category called Social. When you click on Social, it will show you all traffic that comes from all of the different social channels. 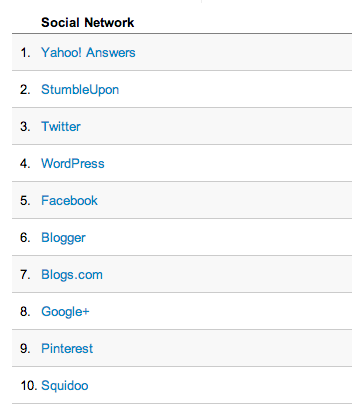 You can view your social traffic sources with Google Analytics. You can click on a social network—Facebook, for example—and it will show you which URLs Facebook drives the most traffic to. You can narrow it down to a specific day or over a certain time period. You’ll discover how to see the traffic source for your sales pages and why this is great for comparative analysis. Listen to the show to hear how you can use Google Analytics to see if there are any increases or decreases in traffic trends from Facebook. If you have a website that has a lot of traffic, then it’s important to put up a Facebook Like box for pages. When someone visits your site and they are already logged into Facebook, they will see their friends who are already fans of your page. They can become a fan with the click of a button without leaving your website. 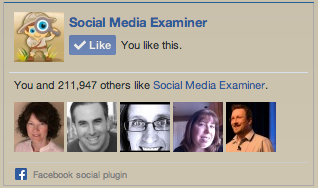 The Facebook Like box on Social Media Examiner. It’s a great way to grow a healthy following for your Facebook page, just with the traffic that comes to your website. Listen to the show to find out why this type of button works better than a Like Us on Facebook one. I think it’s more important for you to launch something that you own first and then launch a community. You should start with a website, then a social channel. The reason is because you rent open ground with a social channel and there are no assurances that your content will be seen. To acquire fans, you need to have a hub or destination for them to go to. 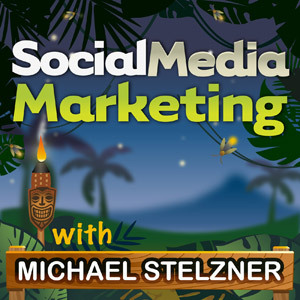 You’ll hear how the team at Social Media Examiner uses Twitter and Facebook to find interesting articles to share with our audience. Check out our Getting Started With Social Media: Resource Guide, which contains a number of resources to help bring you up to speed. At Social Media Examiner, we have two primary pages. One for Social Media Examiner and one for My Kids’ Adventures. To manage Facebook, we use the built-in tools. We like to use Facebook’s tools to schedule posts because in the past, Facebook has penalized people who use third-party tools. For the most part, Facebook is a very manual process. I’m not in a position like you are with many different clients to manage, so there isn’t really a tool I can recommend. If you want to check out some of the tools that are out there, you can visit our Tools category. You’ll discover why we use SocialOomph and HootSuite to schedule tweets ahead of time. Question #3: Amanda Skidmore is marketing director for a startup company called CEU Central, an online education website where health professionals can take the continuing education courses they need to renew their professional license. Unfortunately there is no simple answer to this. It really comes down to resources. In an ideal world, you should have separate social channels for each of the primary audiences that you are trying to reach. If you have different products with different audiences, then it does make sense to begin to develop different communities. Having said that, it can become a management nightmare. I would encourage anyone who has gone through this to let Amanda know what your thoughts are in the comment section below. All you have to do is create a separate category inside of WordPress. We have a category called Podcasts, where every podcast is tagged with that particular category. So when you go to www.socialmediaexaminer.com/podcast it will only show you the blog posts that are tagged “podcast.” All we did was create a forwarding URL that takes users to www.socialmediaexaminer.com/category/podcast-episodes. You can create any category you want. These categories can have their own RSS feed. 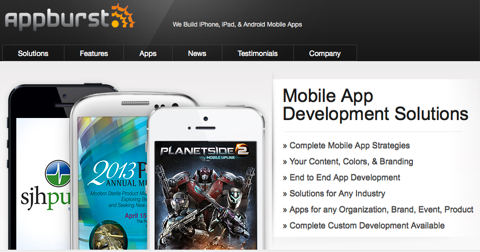 In the end, it’s how you can create what appears to be a customized subsection of your website. 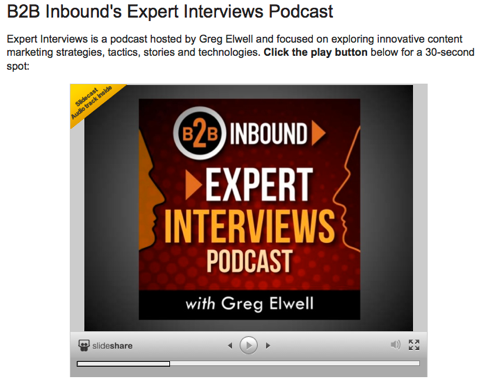 You’ll hear why we hired a developer to create a special code for the podcast category. 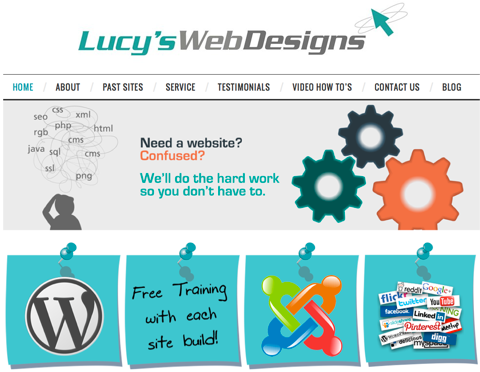 Question #5: Lucy from Lucy’s Web Designs creates websites for clients and teaches them how to keep them up to date. I know that some people copy and paste their entire article onto social platforms, and I’m not necessarily an advocate of that. When I talk about sharing content across social networks, I’m not talking about republishing or redistributing your content, I’m actually talking about linking back to your content. The idea is to drive as much traffic back to your website as possible. You can take a portion of your content, such as the first couple of paragraphs, and put it on the different social networks and have a Click Here to Read More option. You’ll hear the disadvantages of when you publish your content elsewhere and why Google will penalize you. Question #6: Mike Haldas, co-founder of AppBurst, develops content-driven applications for businesses and events. Mike shares his concern for competitors’ ability to use tools to research and find social media connections on every major platform. I don’t think this is a huge concern. For example, we have 230,000 email subscribers and 210,000 Facebook fans. There isn’t necessarily a correlation between the Facebook fans and the email subscribers. I’ve learned over the years that different people want to consume content in different ways. For example, a lot of our email newsletter subscribers are now probably following us on Facebook instead, because they don’t want to get our emails anymore. In addition, there are people who discover us on Facebook who have no idea that we have an email newsletter list. More importantly, there’s no way for me to know who all of our fans are on Facebook very easily, let alone our competitors. Facebook likes to keep this information private. I believe only LinkedIn groups allow the administrator to download this type of information. You’ll find out why it’s more important to grow a following on these social networks and how you can use this to move people into your lead funnel. Call in and leave your social media–related questions for us and we may include them in a future show. Listen to the show to learn more and let us know how this works for you. I want to bring you up to speed on My Kids’ Adventures. This is a project I have been working on for the last 5½ months. Watch this video to get a feel for the vision for My Kids’ Adventures. The reason why I started this website was because as a busy parent, I felt like I wasn’t spending enough time with my kids. At the end of the workday, I didn’t have enough creative juices to think of something fun and exciting to do with them. So I brought together a lot of creative minds, and at present we publish fun and adventure-themed activities three times a week. Since our launch in mid-July last year, we have had more than 142,000 unique visitors to the site and the video above has been viewed 9,300 times. These figures are awesome. I’m trying to make a huge impact in the world and I could use your help. The first thing that you can do is to head over to My Kids’ Adventures and take advantage of all of the great free resources. There is also a Resource Guide where you will find activities in every category you can imagine. The other way you can help with My Kids’ Adventures is to apply to become a writer. If you are really creative and do fun stuff with your kids, we would love to hear from you. If you can help us get the word out, visit here. Social Media Marketing World 2014 is our physical mega-conference, which is set to return to San Diego, California on March 26, 27 and 28. The conference features more than 60 sessions in four major tracks: social tactics, social strategy, community management and content marketing. The excitement for this conference is building like nothing we’ve experienced before. The average temperature in San Diego is 72°, so why not bring your family and make a vacation out of your business trip? There are some awesome attractions in San Diego, including the world-famous San Diego Zoo, the Safari Park, SeaWorld and LegoLand. Check it out and make sure you click on the Travel section to see all that San Diego has to offer. Read Jon Loomer’s guide on Facebook Link Thumbnail Image Dimensions. Learn more about Open Graph. Use WP Open Graph plugin for WordPress sites. Try Facebook’s Debugger to keep your content up to date on Facebook. Install Facebook’s Share button on your website. Use WordPress’s Facebook social plugins on your website or Digg Digg’s Floating Share Bar. Install the Facebook Like Box for Pages plugin for your website. Check out the Getting Started With Social Media: Resource Guide. 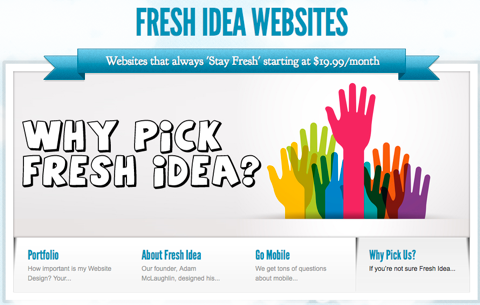 Head over to Fresh Idea Websites, CEU Central, the Expert Interviews podcast, Lucy’s Web Designs and AppBurst. Use SocialOomph and HootSuite to schedule tweets. Learn more about Social Media Marketing World 2014. Contact Emily at emily@socialmediaexaminer.com if you are interested in corporate sponsorships for Social Media Marketing World 2014. What do you think? What are your thoughts on these 5 Facebook marketing hacks for your website? Please leave your comments below.